As seen on Cosmos … the collision and merger between our Milky Way galaxy and the nearby Andromeda galaxy 4 billion years from now. The video below illustrates what NASA scientists announced in 2012 – and what the Cosmos TV series featured in 2014 – that the nearby Andromeda galaxy will collide and merge with our Milky Way galaxy 4 billion years from now. The video (from the Hubble Space Telescope news center) is from a series of photo illustrations, showing the predicted merger between our two titan spiral galaxies, as seen in Earth’s sky. Will Earth as a planet survive long enough to see this? A word about that at the end of this post. The sequence is inspired by dynamical computer modeling of the inevitable future collision between the two galaxies. Will Earth survive long enough to see this merger of galaxies, as depicted in the video above? Earth as a planet might, but life on Earth – probably not. Astronomers say that the luminosity, or intrinsic brightness, of our sun will steadily increase over the next 4 billion years. As the sun’s luminosity increases, the amount of solar radiation reaching the Earth will also increase. It’s possible that – around 4 billion years from now – the increase in the Earth’s surface temperature will cause a runaway greenhouse effect, perhaps similar to that going on now on the planet next door, Venus, whose surface is hot enough to melt lead. No one expects to find life on Venus. Likewise, life on Earth will probably not exist 4 billion years from now. What’s more, our sun is expected to become a red giant star eventually. A probable fate of the Earth is absorption by the sun in about 7.5 billion years, after our sun has entered the red giant phase and expanded to cross Earth’s current orbit. 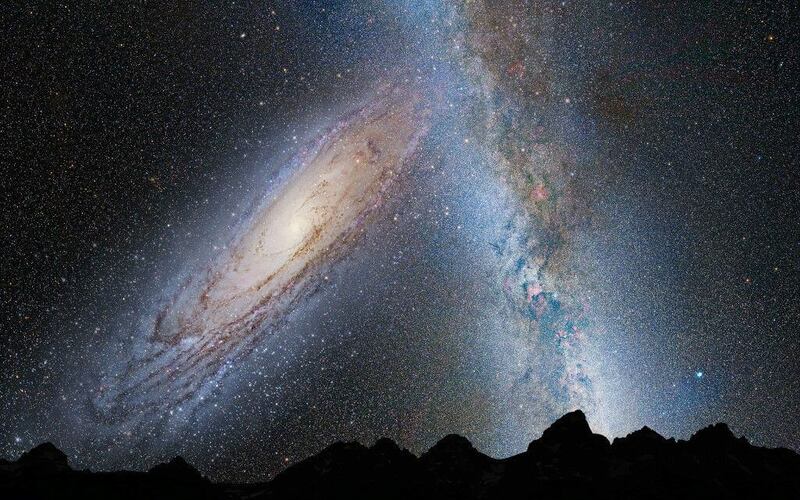 Bottom line: As our Milky Way galaxy and the Andromeda galaxy merge, beings who live in either galaxy will have a spectacular view in our night sky. A NASA video – inspired by dynamical computer modeling of the inevitable future collision between the two galaxies and made from photographic stills – shows the evolution of Earth’s night sky over the next 7 billion years.